Economic catastrophe usually brings social protest and demands for change-or at least it's supposed to. But when Thomas Frank set out in 2009 to look for expressions of American discontent, all he could find were loud demands that the economic system be made even harsher on the recession's victims and that society's traditional winners receive even grander prizes. The American right, which had seemed moribund after the election of 2008, was strangely reinvigorated by the arrival of hard times. The Tea Party movement demanded not that we question the failed system but that we reaffirm our commitment to it. Republicans in Congress embarked on a bold strategy of total opposition to the liberal state. And TV phenom Glenn Beck demonstrated the commercial potential of heroic paranoia and the purest libertarian economics. 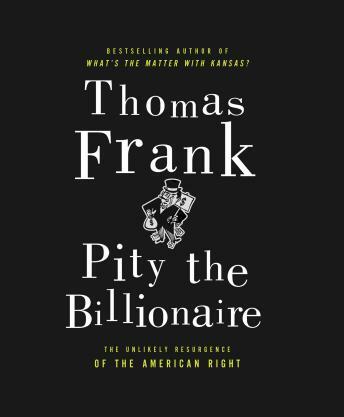 In Pity the Billionaire, Frank, the great chronicler of American paradox, examines the peculiar mechanism by which dire economic circumstances have delivered wildly unexpected political results. Using firsthand reporting, a deep knowledge of the American right, and a wicked sense of humor, he gives us the first full diagnosis of the cultural malady that has transformed collapse into profit, reconceived the Founding Fathers as heroes from an Ayn Rand novel, and enlisted the powerless in a fan club for the prosperous. What it portends is ominous for both our economic health and our democracy.